Gladys Gbegnedji is a Civil Engineer from Spain. 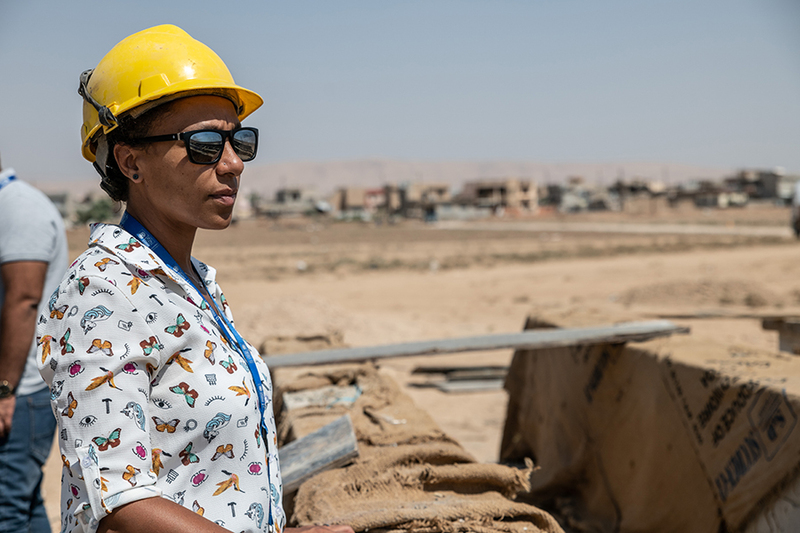 Together with 14 other UN Volunteers and engineers, she is in Iraq to support UNDP reconstruction efforts in Mosul Governorate, in the areas liberated from the Islamic State of Iraq and the Levant (ISIL). In Iraq, 15 UN Volunteers like Gladys Gbegnedji (Spain, left) review and improve construction designs and develop technical tender documentation. They support dozens of Iraqi engineers by ensuring adequate contract management and monitoring. The Funding Facility Stabilization of Iraq was established by UNDP in June 2015, to help newly retaken areas from ISIL to return to normal life. The programme is currently implementing more than 1,100 reconstruction and rehabilitation projects in 28 locations in Iraq. Gladys supports a team of twenty-four local engineers, directly involved in the reconstruction of water treatment plants, schools, electrical substations and hospitals. "My responsibilities include conducting field visits to assess reconstruction projects, review and improve construction designs and develop technical tender documentation," she explains. Gladys comes from the private sector and has 15 years of experience as Civil Engineer. She worked within some of the largest construction companies worldwide in Spain for 10 years. After spending two years in Ghana and contributing to the construction of nine hospitals there, she decided to offer her expertise to the United Nations and to volunteer with UNDP in Iraq. She describes it as a rewarding experience. "I remember with special affection when we went to visit several schools in Tel Kaif, a city of 40,000 inhabitants north east of Mosul," she recalls. Iraqi forces recaptured the town from ISIL in January 2017. "A year and a half later, the rehabilitation of the schools was already completed, and kids were attending classes. Everybody was so grateful to UNDP and to the work done by our team. They all wanted to take pictures with us. That day, I felt really happy and proud." The surge of violence in Iraq has produced three million internally displaced persons across the country and over 11 million Iraqis in need of humanitarian assistance. Over 90 per cent of displaced persons live in host communities, predominantly in the Kurdish Region, which experienced a 30 per cent increase in population over two years due to the crisis. Moreover, many Syrians have taken refuge in Iraq. UN Volunteers, both Iraqis and internationals, have been serving in Iraq since 2011, mainly as Engineers, Community Development Officers, Protection Officers and Programme Officers.